A year ago, when I first tried to explain to my brilliant friend Antigone the community-wide floral phenotypic integration that we had recently discovered, she interrupted my nervous PopSci-like narration saying: “Wait, are you telling me that it’s like I see the color of a flower and I know what it smells like or vice versa?” "Well", I said, "roughly yes; supposing of course that you were a bee". To our surprise, this was found to be true for many of the 41 insect-pollinated plant species growing in a low scrubland on the Greek island of Lesvos. The study site in Aghios Stefanos, Lesvos Island (photo by A. Kantsa). Mediterranean scrublands are extraordinary habitats. The landscape is dominated by low vegetation consisting mainly of shrubs, adapted to the rough summer of the five Mediterranean climate regions of the planet: the Mediterranean Basin, Southern and Baja California, Central Chile, the Cape Region in South Africa, and Southwestern Australia. In Greece, this biome is called phrygana (a term first used by Theophrastus), which means “fried” in Ancient Greek, probably owing to their high flammability or/and to their dull summer coloration that often makes them indistinguishable from the rocks and the soil, at a distance. However, for approximately four months, an Eden-like transformation reveals a unique richness of flowering plants showing off dazzling palettes of floral colors and releasing rich bouquets of floral fragrance. Flowers in the phrygana. (a) Cistus creticus visited by Eulasia nitidicollis, (b) Lavandula stoechas subsp. stoechas visited by Colias crocea, (c) Genista acanthoclada, (d) Tuberaria guttata, (e) Teucrium divaricatum, and (f) Cistus salviifolius, visited by Apis mellifera (right) and Epicometis hirta (left) (photos by A. Kantsa). Dominated by aromatic plants, in spring and early summer, the odorscape of phrygana is somehow analogous to a colony of Emperor Penguins in Antarctica at the time females arrive: as “loudly fragrant” as it gets. So, given that the plants’ volatile emissions function as chemical signals mediating interspecific communication, our initial research goal had been to investigate the role of floral scent in the structure of the spring pollination network, hypothesizing that the chemical phenotype could be strongly associated with flower visitation patterns. This required to collect and analyze the floral scents of the insect-pollinated plants in the community, which was by far the most challenging task in this research. Because we used in situ dynamic headspace collection under the hot sun and the strong winds of the Aegean Archipelago, we had to standardize the collection times for the species and set up the collection conditions so that we wouldn’t lose volatile compounds, e.g. due to condensation. This resulted in many unsuccessful trials, several gimmicks (from windblown umbrellas to countless rolls of aluminium foil), and hundreds of hours of GC/MS analysis to make sure that we had indeed captured the live emissions during the pollinators' activity. In 2014, after the floral scent collections had been already completed, a portable spectrometer was added to our lab’s equipment, triggering me to measure the floral reflectance of all these species as well. This meant a significant delay of my graduation date, actually for more than a year. However, this is a decision that I will never regret making, because although it had a cost (not easy at all to persuade the grant committee about the necessity of a generous deadline extension), it contributed to the surprising discovery. Furthermore, it was highly important to know what bees and butterflies see, so calculating colorimetric properties according to their visual systems was also of paramount importance in order to reach human-unbiased conclusions and get as close as possible to the whole story. Two of the flowers of the "red module" in the plant-scent network of the community. Left: Anemone pavonina visited by glaphyrid beetles. Right: Serapias cordigera visited by Rhodanthidium septemdentatum (male) (photos by A. Kantsa). 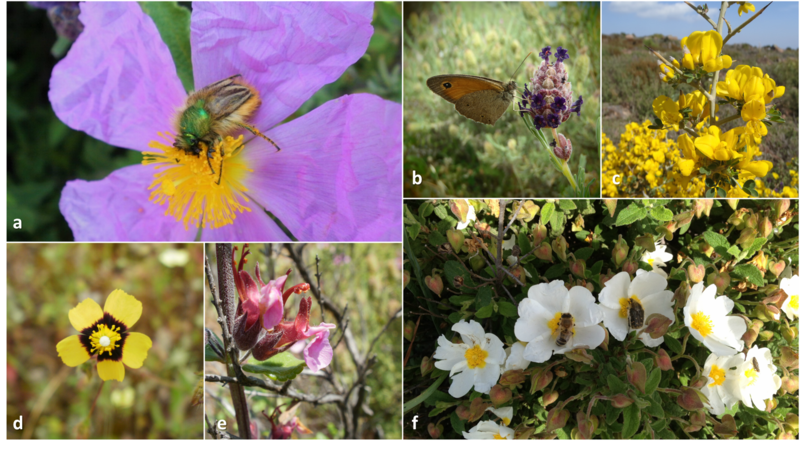 Floral phenotypic integration in an entire community may imply several metabolic and ecological advantages, such as ensuring the successful navigation of pollinators in the wuthering coasts of the Aegean islands, enhancing pollinator constancy, and mitigating the unpredictable physiological costs of producing pigments and volatiles independently. A personal favorite finding, which finely epitomizes a central adaptation of the phrygana plant community, is the connection of the red color of the corolla and the emissions of long-chained aliphatic compounds. The red flowers, which are nearly colorless (thus least attractive) to bees as well as nectarless, are all grouped in the aliphatics module of the plant–scent network of the community, emitting mainly long-chained aliphatics. These flowers offer only pollen and/or shelter to bees. Bees are the most diverse and important pollinators in the scrublands of the Mediterranean Basin, so we suggest that they are the most "desired" pollinators for many species in the phrygana. Could thus these flower compensate for their visual inconspicuousness to bees by alluring them with long-chained aliphatics, which are known sexual attractants for several bee families? If true, this would represent a unique coordinated adaptation or an exploitation of bees' sensory system in a community-context. Last but not least, this result highlights that network analysis is an excellent tool for exploring metabolic datasets of plant assemblages and exploring the alpha chemical phenotypic diversity in communities. My kingdom for more investigations of the sensory floral phenotype in communities of the other Mediterranean regions of the world, as well as in biomes where pollinators other than bees corner the floral markets, such as the alpine meadows. Are the species compositions in natural communities around the world linked to the sensory abilities and biases of pollinators?